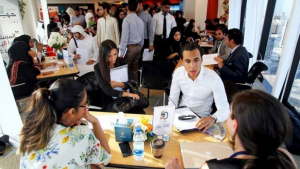 With an array of employment offerings being made by private companies and government offices, the three-day job fair organized at Expo Centre, Sharjah provides a golden chance for recent graduates and professionals to find opportunities across their fields. The 21st edition of the Sharjah National Career Fair 2019 has been a perfect place for job seekers to meet recruiters. Not only that, those attending the fair can also acquire new skills to be uses in planning or advancing their career. A number of leading organisations from both the public and private sectors are participating in the event, including major banks, such as ADCB, ADIB, Dubai Islamic Bank, Emirates NBD, HSBC, Emirates Islamic, Rakbank, as well as other popular companies, such as Adnic, du, Etisalat, Dubai Health Authority and Emirates Post Group, among others. For the last edition, new participants include Department of e-Government – Sharjah, Ministry of Health Sharjah Book Authority and Al Naboodah Group. These participating entities are receiving applications from visitors. All applications are added to an auto-recruiting service and updated in the relevant department’s database.